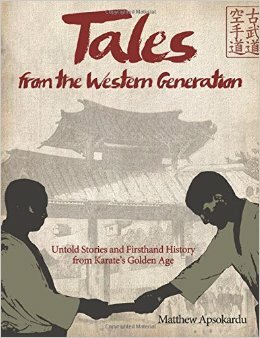 I finally got around to reading Tales from the Western Generation: Untold Stories and Firsthand History from Karate's Golden Age written by the author of the blog Ikigai Way, Matthew Apsokardu, a longtime practitioner of Okinawa Kenpo. In this expansive work, Mr. Apsokardu explains how the martial arts came to prominence in America followed by interviews with some of the first generation of American karate teachers who had an impact on the arts' development in the US during the formative period of the 1950s, 60s and 70s. Of course as an Isshinryu karateka I was happy to see a section devoted to my style which included a Q and A with Hanshi Ed McGrath, Shihan Nick Adler, and Sensei Marilyn Fierro, all of whom I've had the privilege of training with or receiving rank from, especially Shihan Adler. One of the things I like about the book is that the author allows us to look under the hood of his writing methodology, as it were: what parts were deemed important for inclusion and why certain persons were selected to be interviewed. Sections include "The Burgeoning Karate Scene in the U.S.A.", "Opening Doors, Breaking with Tradition", and my favorite, "The Use and Abuse of Storytelling". Highly recommended.